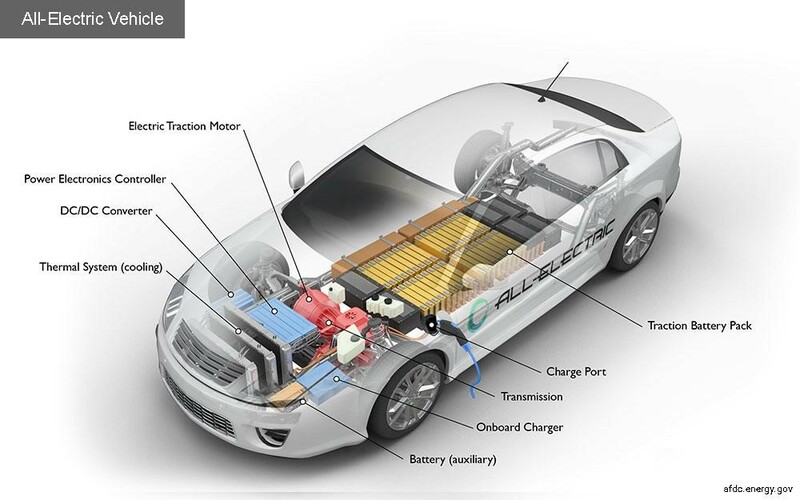 You may own an electric vehicle (EV) but, do you know how the battery technology works? And, how they differ from an internal combustion engine vehicle? In this article, we focus on how an EV battery operates, the types of EV batteries available on the market today, and, what battery innovation we may see in the future. The first thing is to distinguish between an all-electric, or battery electric vehicle and a hybrid. A battery electric vehicle, or BEV, uses an electric motor in place of an internal combustion engine used in gasoline-powered vehicles. BEVs use a traction battery pack to store electricity, power an electric motor, which in turn drive the wheels. A hybrid (HEV) also contains a traction battery pack, however, unlike BEVs, has a combustion engine. An HEV runs on electric power until fully depleted, and then switches to the fuel available from the combustion engine. The U.S Alternative Fuels Data Center put together a simple illustration of all the components of a BEV. For more information head to the link provided. As mentioned, EVs have an onboard battery pack to store electricity. When fully discharged, you connect your vehicle to a power supply to recharge (other recharge methods include regenerative braking and in the case of an HEV an internal combustion engine or home solar power). Then, when required, electricity is drawn to power the electric motor and propel the vehicle forward. Battery compounds have developed over time. In the 1980s lead-acid batteries were used in EVs. However, the latest generation of EVs uses Lithium-ion. Lithium-ion appears to be the preferred choice for vehicle manufacturers because of the significant improvements in performance. With that said, let’s explore the battery options available on the market today. Various types of EV batteries are available. However, the focus here is on Nickel and Lithium-ion. Nickel-metal hydride (NiMH) batteries require hydrogen, nickel, and titanium to store energy. This transfers to a much lower manufacturing cost compared to Lithium-ion. However, the majority of vehicle manufacturers have switched to Lithium-ion as the cost to produce continues to decline. The most significant advantage of NiMH batteries is their durability. They last much longer in comparison; other battery compounds require modifications to compete. Moreover, NiMH is much friendlier when it comes to recycling, as they contain only a small amount of toxic material. The main obstacle for NiMH is their significantly low energy density. Compared to Lithium-ion its 40 percent lower. Energy density is the amount of energy stored by volume, in the context of EVs, this relates to the amount of extractable energy to drive the vehicle. Also, when fast-charging and discharging under load, NiMH generates heat, which means a cooling system is needed which in turn adds weight. Weight limits the number of batteries that can be installed, and as a result, the vehicle range suffers. Lithium-ion provides some solutions to the pitfalls of Nickel-based batteries. The majority of EVs on the roads today will contain a lithium-ion battery. This kind of battery is also commonly used in personal electronics such as smartphones and computers. One distinct advantage of Lithium-ion is the high power-to-weight ratio. Meaning, batteries hold relatively high levels of energy for their weight. As a result, EVs can be lighter. Less weight improves range and performance, furthermore, limits the environmental impact. Lithium-ion batteries also have a low self-discharge rate, in other words, the ability to hold a charge, which leads us to memory effect. Memory effect relates to what happens to battery capacity after repeat charging. Lithium-ion batteries are supposedly least affected by this problem, while Nickel-based compounds suffer the most. And therefore, given the driving demands of EVs, Lithium-ion is the superior battery at present. The cost is by far the biggest hurdle for Lithium-ion batteries. Compared to nickel-based batteries, production costs can be as much as 40 percent higher. This cost is likely being passed onto consumers, which remains a significant barrier to EV adoption. However, as previously noted the cost of Lithium-ion batteries is falling. Mckinsey shows an 80 percent drop in cost from 2010 to 2016. Increased production and technological advancements have driven the decline in cost, and forecast to fall even further. While Lithium-ion self-discharge rate is much lower than its competitors, is it still an issue of concern. No matter what, the level of energy capacity will decrease over time. With that said, research has shown charging habits can help preserve battery life. In short, Lithium-ion offers the best results over its rivals, but they are still far from perfect. Technological developments will hold the key to tackle the current shortfalls in battery performance. The desire to decarbonize transportation has encouraged technological developments in batteries. Bloomberg predicts that global EV sales will reach 54 percent by 2040. With increasing demand, there will be a requirement for better performing batteries. Weight reduction. Improved cycling ability, to meet all consumer charging habits. Increased use of recyclable material. And, overall better range and performance under load. Solid-state batteries are considered to be the next generation of EV battery chemistries. Why? Because solid-state technology provides a high energy density that improves on today’s lithium-ion batteries. It replaces the liquid form electrolyte with a solid, conductive material. BMW and Solid Power partnered in late 2017 to develop a solid-state battery for future EV models. Honda, Toyota, and Volkswagen have all reported activity, working towards commercially viable solid-state electric vehicle batteries. Nexeon, a government funded project based in the UK, is developing new materials that could double EV range. The project is developing materials based on silicon to replace carbon in the anode of Lithium-ion batteries. The combination of Silicon and binder will increase battery cells energy density considerably. The ultimate goal of the project is to develop a graphite-based anode that will enhance the effective range of EVs to over 400 miles on a single charge. Major automotive OEMs and cell makers have expressed an interest and will be collaborating as the project develops. And so, coming full circle, EV batteries have served early adopters well. However, there are limitations. Matters of weight, range, environmental impact and performance are legitimate concerns. But, the question of technological breakthroughs in EV batteries is a matter of when not if.